In Kentucky, LGBT people can still be fired from a job, denied a place to live, or kicked out of a restaurant. RALLY for a Statewide Fairness Law! Pride has come to the city of Georgetown. On October 8, Georgetown Fairness held Georgetown's first Pride Festival. If you attended the KFTC annual meeting, you saw one of the Shelby County chapter’s newest members, Joy Fitzgerald, give the chapter petition. She woke up the room with her excitement about being a member of KFTC. Another new member, Mari Mujica, also attended her very first annual meeting. Join KFTC as we table at the first ever Georgetown Pride Festival! 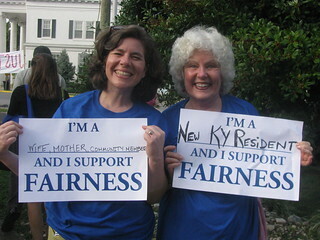 Join us as we register voters, talk about the work to pass fairness ordinances across the state, and promote www.kentuckyelection.org!